In North Queensland in the late-1970s it seemed that there were precious few people interested in aviation heritage, or at least that’s how it appeared to this [then] teenage university student. Those few did manage nonetheless to find each other and spend long hours together exchanging tidbits concerning the region’s rich aeronautical heritage. As the youngest of this unlikely gathering I had the most to learn, and the least to offer. And so I hung off every word they uttered, scribbling down both fact and rumour. At one such evening gathering, in December 1978, Neil Groves produced a blurry photograph of a Fairey Battle displayed – so he claimed – in front of All Souls’ School in Charters Towers. Thanks to the internet, I’ve recently been able to determine the identity (viz. K9411) of that particular aicraft. For decades this had eluded me, my notes from thirty-seven years ago indicating, misleadingly, that it may have been KB411. 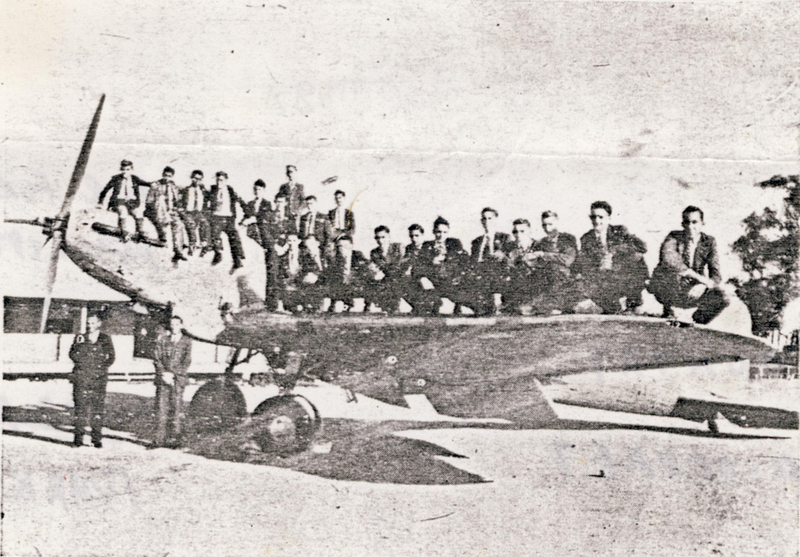 Aviation Class, 1946 – photocopied from page 23 of ‘The Phoenix’ (All Saints’ school magazine). Officially, K9411 was sold in March 1947 by the Commonwealth Disposals Commission to the Townsville Grammar school for £5. While this can’t be altogther discounted, it’s clearly at odds with the fact that it was being used by All Saints as a training aid, in Charters Towers, in 1946. The plane was purchased by the School for an aviation class conducted by Mr R L Mills (Headmaster) and Mr D J FitzGerald. The aircraft did not fly and was simply used to used ti illustrate various principles. ‘Bidge Mills’ was O.C. Air Cadets for the region so I suppose this was the reason the School was offered this aircraft. The plane was placed near the main entrance from the Townsville Road. It stood out in the open, was subjected to much pilfering, and soon deteriorated in appearance. Consequently Canon Hurst decided to get rid of it and it was sold to a wrecker who had a forge operating in Sam Hill’s old blacksmith’s shop near the corner of Bridge and Plant Streets. This furnace ran non-stop for all of six months and was fed all the army and airforce junk which littered the landscape after the war. I think this happened in 1919 – 1950. It was a pity it had to go but it would have taken a lot of money to preserve it…The School just couldn’t afford the luxury.